SO here's one model launch at the Milan show that will surprise only those under a very comfortable rock: BMW's R nineT Scrambler. 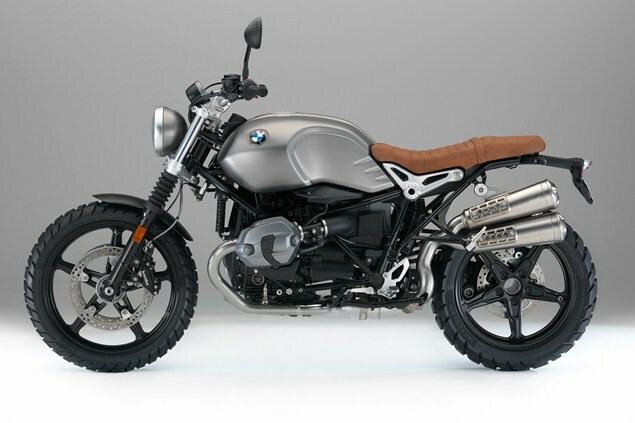 Like the concept that was revealed in June, it's based closely on the R nineT but has lower-spec suspension and brakes. The R nineT's upside-down Öhlins forks have been swapped for right-way-up 43mm ones with gaiters and 125mm of travel. Four-piston calipers biting 320mm front brake discs replace the R nineT's radial-mounted monoblocs. The R nineT's aluminium tank has gone in favour of a steel one. The Scrambler has also been given a 19-inch front wheel, deep-tread tyres, a high-level exhaust and higher bars than the R nineT. The seat is more thinly padded and the pegs lower and more rearward. Wire-spoked wheels, knobbly tyres, a single-seat sub-frame and an ally tank are among a range of options and accessories. It's air-cooled 1170c boxer-twin engine makes a claimed 110hp at 7,750rpm and 85.5lbft at 6,000rpm. The bike's 'road-ready' weight is a claimed 220kg. Price is to be confirmed. It's available in one colour, described as ' monolith metallic matt'. AKA brown.